Because sometimes, the only thing you can do is take your kids out and let them play. 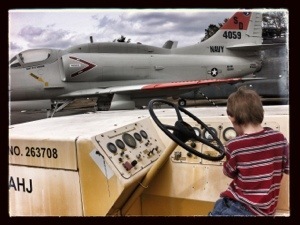 Today, we went to our local Naval Aviation museum. My son loves checking out the airplanes. He is able to get up close and personal with them. 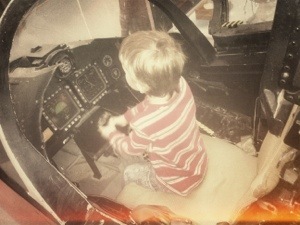 He can touch, feel, climb in (some) and really learn to love the airplanes. I think these moments are important. We of course go to the park, we go to the beach and we play in the backyard. But I love to see the look on my son’s face when he gets to slide into the cockpit of a jet airplane and grab the stick. Sure, he isn’t going anywhere, but I can see those wheels turning. 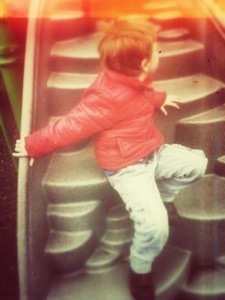 Of course, those trips to the park are not to be taken lightly. The ability to run, scream, jump and climb without tearing down Mom’s drapes are important. Oh spring. I can’t wait for you to come. Who else loves to take their kids and get them out of the house? Any place that your little one loves especially? This entry was posted in family and tagged airplane, aviation, Children, drapes, jet airplane, jets, museums, naval aviation museum. Bookmark the permalink. There is nothing better than hands on learning! Who knows where it will lead? My little one is not quite at that age yet but getting out of the house is so important… we spend a ton of time at parks, at the beach, and at the good old fort just running as fast as her little legs can carry her. It feels so great to get them out of an area of “no, don’t touch that!” and into a space where they can just get all of that energy out and be good and tired at the end of the day. You’re a great mom, Lisa.